Israel announced a major pipeline project from the gas fields off its shore involving four countries, terminating in northern Italy. The EastMed Pipeline could be one of the longest in history as well as one of the most technically difficult to pull off. The deal was announced on World Israel News a few days ago and has been in negotiation for a couple of years now. It’s being billed as a counter to both Arab and Russian power but that’s not really true. This will supposedly deliver 20 bcm annually to Cyprus, Greece and Italy and come at a significant cost because of the challenge of it. But the first train will be 10 bcm according to IGI Poseiden’s website, the company building the pipeline. 10 bcm is similar in size to the Southern Gas Corridor bringing gas in from Azerbaijan. No discussion of cost was in the announcement. It was all about the politics. But, the politics of this is Kabuki theatre. The Russians don’t care about more pipelines to Italy, now that Turkstream is ongoing and Europe’s gas needs are accelerating. This is a European Union project developed by IGI Poseidon under the auspice of the EU’s Connecting Europe Facility program. The EU is footing a lot of the bill for this. For all the talk about Russia’s monopoly on the European gas market, it’s simply untrue. Russia supplies between 35% – 40% of Europe’s gas. That share has increased because of rising demand and no new pipeline developments. And for Europe, the most economical gas is that delivered by Russian pipes. Both the STC and EastMed pipelines will be profitable but only after the EU portion of the funding is written off, which it will be. EastMed, like the STC, has been in development for nearly ten years. Turkstream went from idea to reality in two. These are projects force-fed onto European consumers for political purposes, not economic ones. Diversification of supply is fine if it makes economic sense. But if it doesn’t all it’s doing it lengthening the time to profit for the people who paid for the project in the first place, the consumers through their taxes. Moreover, if these projects were fundamentally economic they wouldn’t require such a long time to negotiate. The negotiations stem from none of the principles wanting to pay for the uneconomic part of the costs. And that’s where the EU steps in to provide that cost which is then passed onto the consumer. In the end, none of this will truly matter since the need for gas into Europe is so high and unlikely to be replaced by anything else in the foreseeable future. Europe is wedded to bad environmental ideas which, in turn, become bad energy policy. The latest of which is the announcement by French President Emmanuel Macron that France would be shutting down 14 of its 58 nuclear reactors by 2035. The only thing keeping France’s insanely Marxist economy functioning is its cheap nuclear-generated electricity. Macron wants to drop this from 72% of current power needs to 50% and spin up unreliable sources like solar and wind. But, back to Israel and the politics of EastMed, this pipeline, like the SCT from Azerbaijan, doesn’t threaten Russian market share because of its ultimate cost. Transport costs money, even for piped gas. And the longer the pipeline the more transport costs matter. And if Israel finally getting its pipeline to Europe is the price Russia has to pay to help stabilize the region a little bit, then it’s a small one in the end. 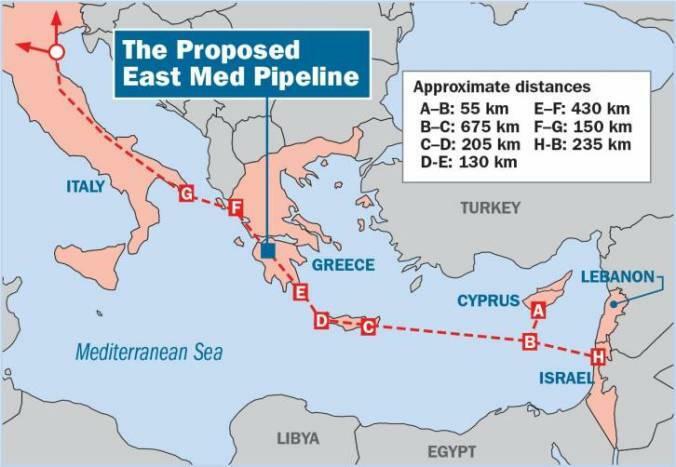 The smarter play for Israel, of course, is to develop a pipeline that goes east to Syria rather than northwest to Italy, but don’t hold your breath there. What I think is interesting is the dichotomy between what Germany gets and what Italy gets in terms of gas supply. Germany gets the massive Nordstream 2 bringing in more than twice what Italy gets from the more expensive EastMed and SCT will bring. Remember, SouthStream’s original plan was to go through Bulgaria, across to Austria and a second stream across Greece to Italy. That was quashed because of U.S. interests in keeping Russia down. And because Israel wanted EastMed and the Saudis were working for a pipeline through Turkey through Syria. And Angela Merkel was only too happy to oblige to keep Greece and Italy from accessing cheap Russian gas. No, they can have expensive Azeri and Israeli gas instead. This is yet another reason why Italy needs to be done with the EU. It is obvious Germany and France want control over energy inflows to ensure political as well as economic dominion over any state that thinks about getting uppity to their rule. This latest win for European Energy Security is exactly that.